Blind Hockey is coming to Halifax!! There will be a meeting to discuss starting up Blind Hockey in Halifax on Tuesday, May 30th at 7:00 PM at the APSEA Residence Building – 5944 South Street, Halifax. For more information, please contact Blind Sports NS Chair, Peter Parsons, at info@blindsportsnovascotia.ca. 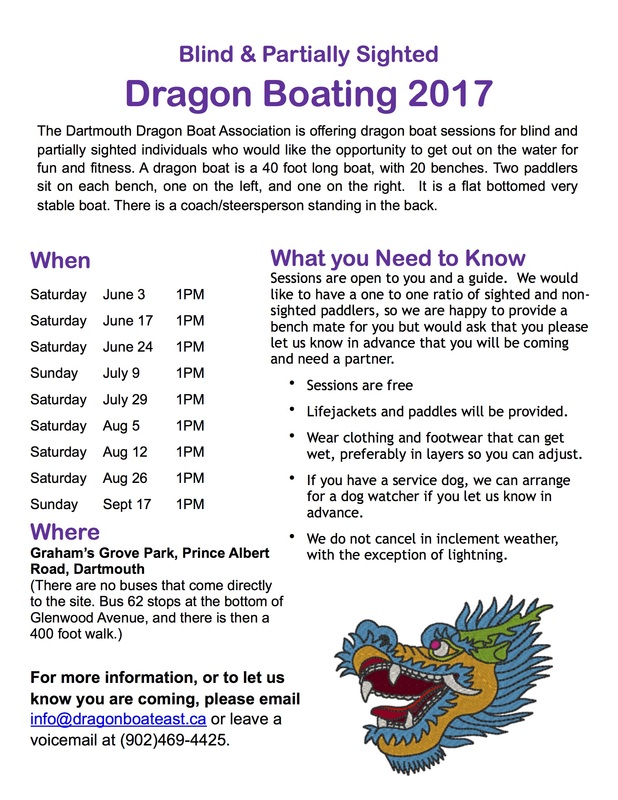 The Dartmouth Dragon Boat Association is offering dragon boat sessions for blind and partially sighted individuals who would like the opportunity to get out on the water for fun and fitness. A dragon boat is a 40 foot long boat, with 20 benches. Two paddlers sit on each bench, one on the left, and one on the right. It is a flat bottomed very stable boat. There is a coach/steersperson standing in the back. For more information, or to let us know you are coming, please email info@dragonboateast.ca or leave a voicemail at (902)469-4425. 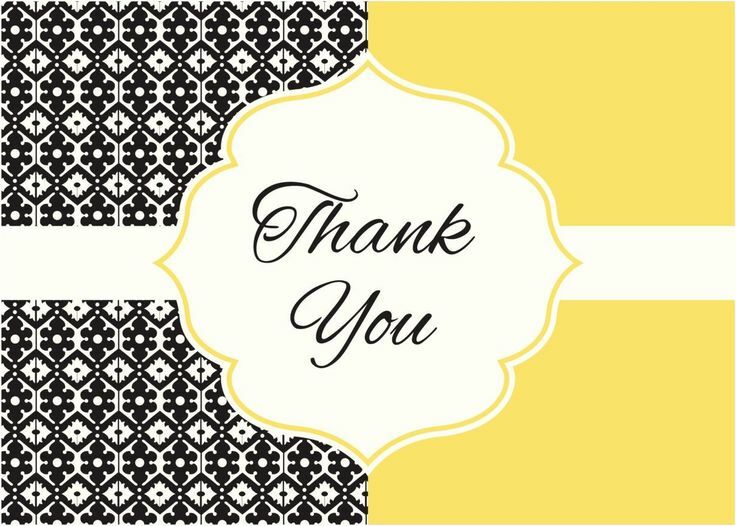 An enormous Thank You to all those business owners and individuals who donated to make this years Blind Sports NS Charity Auction our most successful yet! We raised $5,600. Every dollar will support blind and visually impaired athletes, of all ages & skill levels. We are so grateful and excited to continue growing competitive & recreational sports for all in our communities. Come Try Tandem Biking with us! We’re excited to announce this season’s first Try Tandem Biking event in Halifax! Blind Sports Nova Scotia’s Tandem Bike Club invites anyone with Vision Loss interested in trying out and learning more about this inclusive recreational sport to participate. We also welcome any friends or family members who interested in becoming a volunteer pilot. This message also serves as a notice for those looking to loan one of our 3 tandems (details below). They are now available to reserve. Where: St Andres Community Centre Parking lot. On Barnstead Lane, off of Bayers Rd. What: Community members with vision loss can try tandem biking in a safe & controlled environment, with experienced volunteer pilots. Please bring a bicycle helmet, if you have one, and let us know if you need detailed directions, bus information, or assistance getting from a bus stop to the event location. Don’t hesitate to contact us with any questions! Tandem biking (on a bicycle for 2), with a pilot, makes getting active in the great outdoors with friends, family, and peers more accessible for individuals with vision loss. A pilot rides in front, steering, shifting gears, and communicating effectively with the stoker (person riding on the back seat). Loan a Bike – We have 3 tandem bikes available for short & long-term loans to individuals with vision loss. We provide riding and safety instruction and a roster of trained volunteer pilots, or ride with a sighted friend or family member. Please contact us with a minimum of 72 hours notice. Group Rides – We host group rides and attend community events, too. It’s a fun way to get outdoors and get active and everyone’s welcome! Email us at tandembikes@blindsportsnovascotia.ca to receive communications about upcoming group rides & other Tandem Bike Club & cycling events! You can also find us on Twitter @BlindSportsNS and Facebook: Blind Sports Nova Scotia. 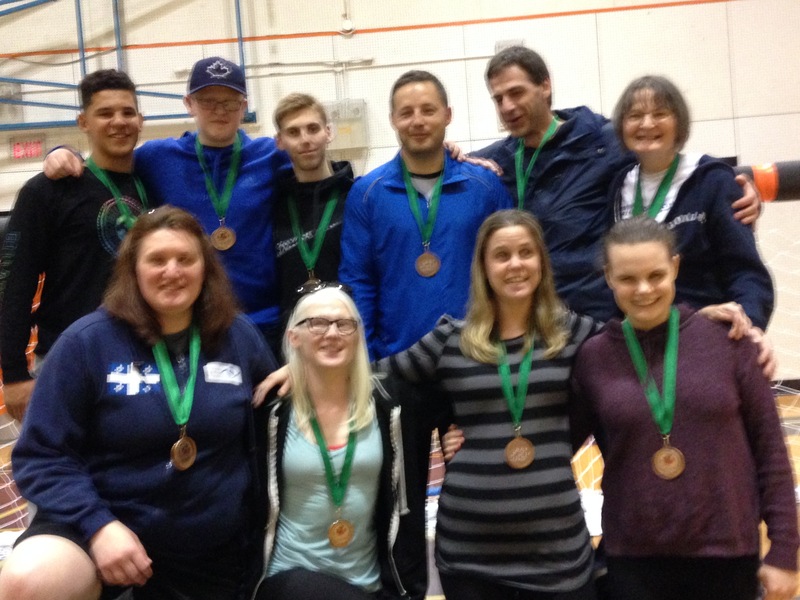 A very belated shout out to the men’s & women’s goalball teams of Nova Scotia. The teams snagged double-bronze at the 2017 Senior National Goalball Championships on the weekend of April 21st. Our men lost 5 to 4 in a close back & fourth finale game with Alberta and brough home their 5th National medal in a row. 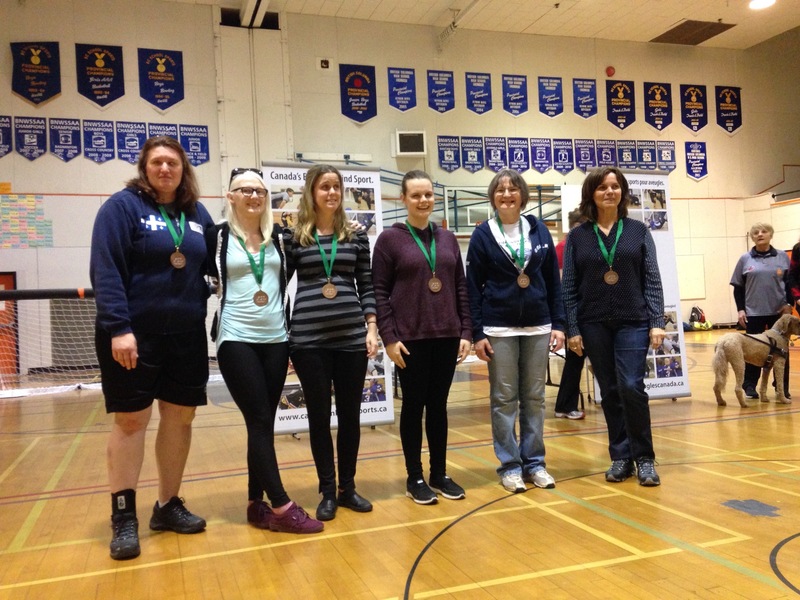 The women (Nova-Q) beat Alberta 9 to 1 in the final game, earning Nova Scotia’s first ever Nationals medal for women’s goalball. Special thanks to Nancy Morin, legendary goalball athlete out of Quebec, and to coaches, officials, referees, volunteers, along with everyone who made the tournament possible. Mason Smith, Alex Angus MacEachen, Simon Richard, Peter Parsons, Oliver Pye, Linda MacRae Triff (coach), Nancy Morin, Jennie Board, Stephanie Berry, Tarah Sawler. 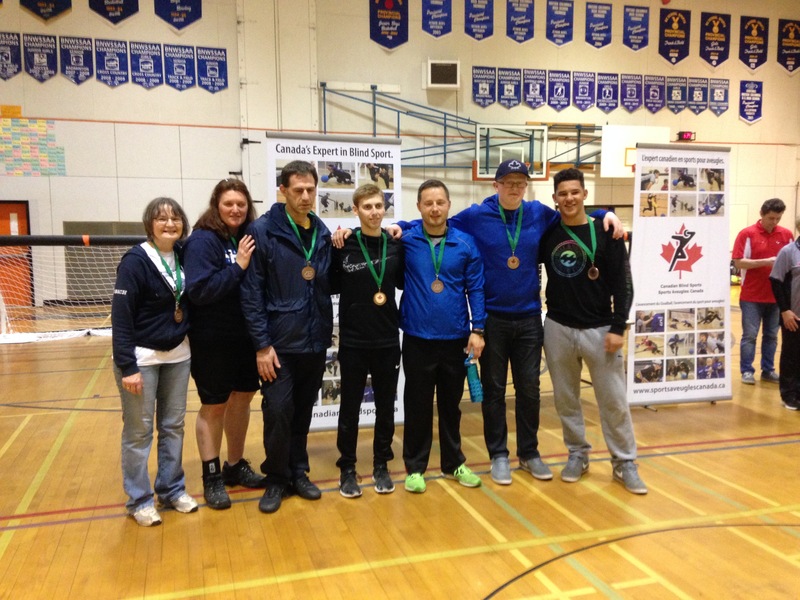 Linda MacRae Triff (coach), Nancy Morin (coach), Oliver Pye, Simon Richard, Peter Parsons, Alex Angus MacEachen, Mason Smith. Nancy Morin, Jennie Bovard, Stephanie Berry, Tarah Sawler, Linda MacRae Triff (coach), Cathy Sadler (coach).